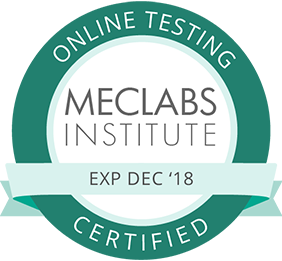 Improve your online testing skills, increase your company's revenue, and advance your career with the MECLABS Online Testing course. The Web has become far more than merely another marketing channel — it’s the heart of your entire business. The Web is the only tool that allows you to peer deeply into the minds of consumers while they make a purchasing decision. By using the Web for this purpose, you’ll be able to answer the fundamental question of why customers say, "Yes, I will take the next step in the sales process." 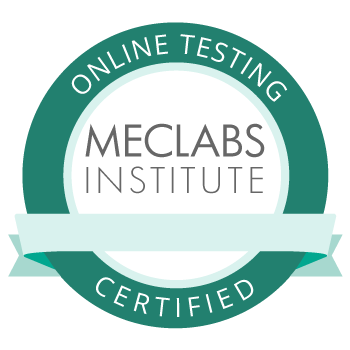 For the past 15 years, MECLABS has been developing the optimum methodology for online experimentation. 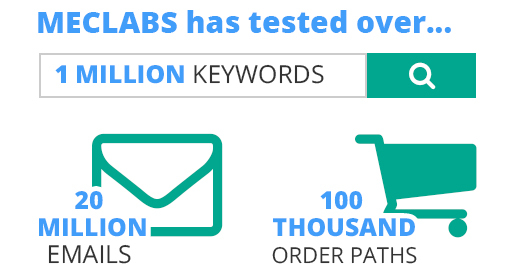 Working with both large and small research partners like The New York Times, Reuters, and Insurance.com, the lab has tested more than 1 million keywords, 20 million email messages, and 100,000 order paths. In this course, you will learn how to determine where to test, what to test, and how to turn basic testing data into customer wisdom and the ability to predict customer behavior. Anybody can set up a test, but not everyone can set up the "right" test. Once you have taken and passed the final exam, you will be designated as a Certified Professional in Online Testing. While more and more marketers are recognizing the need to systematically test their new ideas, few have ever received serious, relevant training in online experimentation. In fact, the average MBA program teaches very little about online testing. We will present several experiments with surprising customer insights that reveal the important of testing. Also, we will provide an overview of the course structure and review the MECLABS Utility of Testing heuristic. We discuss the principle that for a test to be valuable, it must have a properly framed research question which begins with the word “which.” This will equip you to design tests that bridge your customer theory gap. We will teach you the essential definitions of a control, treatment, variable, and value as well as the balancing act between designing treatments with a high degree of variation while maintaining enough precision to answer the research question. With all the analytics platforms we now have, getting sufficient data is typically no longer a challenge, but making sense of it is. We'll teach you to turn "how much" data into "why so" information. We will teach you the four common validity threats in online testing that must be addressed: History Effect, Selection Effect, Instrumentation Effect and Sampling Distortion Effect. This session takes a deep dive into statistics and explains Sample Distortion Effect, Statistical Level of Confidence, and the three factors that determine an outcome's statistical certainty. Unless you're conducting single-factorial experiments (e.g., red button vs. blue button), understanding what you learned and where to go next can be a challenge. This session provides you with a framework to do that. We’re sorry! Unfortunately, we do not currently support Internet Explorer version 9 and below. Please try using another browser if you have one available or contact us at customer.service@meclabs.com for further assistance. Thank you and we apologize for any inconvenience this may cause. 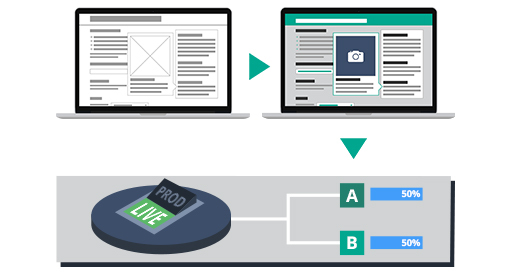 Learn methodologies for testing which version of a landing page leads to the greatest improvement in conversion. "Excellent course, number one. Great opportunity to see how strategy converts into tactical execution. Logical approach, incredidible attention to detail, commitment to experimental methodology. Best devoted marketing theory strategy tactical expectation program I've ever attendeed." I was expecting to learn how to put together a framework for an entire testing program, and that’s exactly what I have. The testing tool provided is something I’m super stoked about, it takes complex mathematical calculations, you just plug in your numbers form your analytics program, and it tells you if your test is statistically valid and what sample size you need to get to 95% level of confidence. "The training, certifications and new set of eyes MECLABS gave me has resulted in over 8 figures for my clients. I am continually referred to as the authority in my market. If I had to start over and learn from one resource alone, it would be MECLABS without a doubt." Check payments are due immediately. Please send a check to the above address and reference the order number from your confirmation email. Check orders are considered pending until the check has cleared our bank and payment must be completed prior to starting your courses. His personal work has focused on the philosophy of human choice, experimental design, and the cognitive psychology of conversion. Dr. McGlaughlin has written or edited more than 250 articles and texts, he has won multiple awards including Harvard’s Speaker of the Year, and he has been quoted in more than 10,000 online and offline sources. McGlaughlin has patented ten conversion-related heuristics and he has conducted large-scale research projects in partnership with companies such as The New York Times, Google, Bank of America, Wells Fargo, and Royal Bank of Canada. McGlaughlin also serves as the Director of Enterprise Research at the Transforming Business Institute, University of Cambridge (UK), as the former Chairman of the Board of Governors for St. Stephen’s University and as a former Trustee for Westminster Theological Centre. He originally studied philosophy and theology at University of London's Specialist Jesuit College. He lives in Ponte Vedra Beach, Florida with his wife and three children. Austin McCraw, Senior Director of Content Production, MECLABS Institute, has been a key decision maker in clearly and creatively bringing the institute’s research and discoveries to audiences nationwide. He is expert at imparting knowledge so that marketers can use it to create greater success for themselves and their organizations. Austin is a seasoned speaker. He has taught the MECLABS Value Proposition Development Course at Fortune 50 companies and enterprise startups. He has worked directly with marketing departments to help them discover and optimize value propositions. He is also a regular host of MarketingExperiments web clinics. His passion for helping organizations identify and maintain laser-focus on their ideal customer is the foundation of each of his presentations. 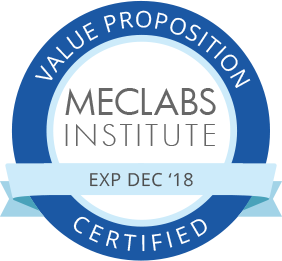 Since joining MECLABS in 2007, he has reviewed more than 2,500 experiments, written more than 300 hours of training, and developed five professional certification courses on the topics of Offer-Response Optimization and Value Proposition. He has worked directly with Dr. Flint McGlaughlin, MECLABS Founder/Managing Director, on academic and commercial writing projects. Prior to joining MECLABS, Austin was promotions director for a PBS affiliate in Gainesville where he was in charge of publicizing local and national programming. He has a bachelor’s from the University of Florida’s College of Journalism and Communications. Our students have reported immediate results from the testing and optimization techniques that they’ve learned in our courses and applied to their own online marketing campaigns. MECLABS has developed the meta-theory of landing page optimization that has been proven to work in thousands of experiments. 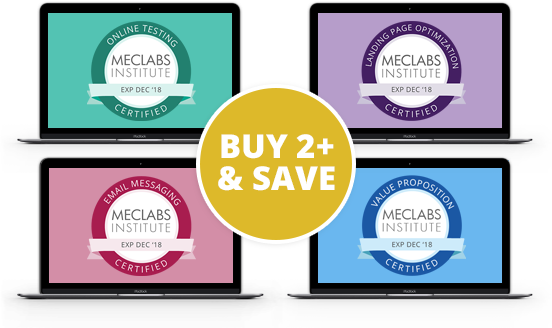 Taught for 10+ years, to thousands of marketers from companies like Google, Cisco, Oracle, Verizon, Vocus and more, this hands-on training course offers you real examples, step-by-step instruction, and insights on how you can optimize your landing pages for maximum conversion. The Web has become far more than merely another marketing channel — it’s the heart of your entire business ecosystem. The Web is the only tool that allows your team to peer deeply into the minds of consumers while they make a purchasing decision. By using the Web for this purpose, you’ll be able to answer the fundamental question of why customers say, "Yes, I will take the next step in the sales process.